Digital Disconnect trains its sights on the relationship between the internet and democracy in the age of fake news, filter bubbles, and Facebook security breaches. Moving from the development of the internet as a publicly funded project in the late 1960s to its full-scale commercialization today, renowned media scholar Robert McChesney traces how the democratizing potential of the internet has been radically compromised by the logic of capitalism and the unaccountable power of a handful of telecom and tech monopolies. Along the way, McChesney examines the ongoing attack on net neutrality by telecom monopolies like Comcast and Verizon; explores how internet giants like Facebook and Google have amassed huge profits by surreptitiously collecting personal data and selling it to advertisers; and shows how these companies have routinely colluded with the national security state to advance covert mass surveillance programs. Even more urgently, the film details how the rise of social media as a leading information source is working to isolate people into ideological filter bubbles and elevate fake news at the expense of real journalism. While most debates about the internet continue to focus on issues like the personal impact of internet addiction or the questionable data-mining practices of individual companies like Facebook, Digital Disconnect digs deeper to show how capitalism itself is turning the internet against democracy. The result is an indispensable classroom resource -- a vital tool for helping students make sense of a technological revolution that’s radically transforming virtually aspect of human communication. Robert W. McChesney is the Gutgsell Endowed Professor in the Department of Communication at the University of Illinois at Urbana-Champaign. His work concentrates on the history and political economy of communication, emphasizing the role media play in democratic and capitalist societies. In 2002 McChesney was the co-founder of Free Press, a national media reform organization. He also hosted the "Media Matters" weekly radio program on NPR-affiliate WILL-AM between 2002 and 2012. From 1988 to 1998 he was on the Journalism and Mass Communication faculty at the University of Wisconsin-Madison, where he was selected as one of the top 100 classroom teachers. McChesney has written or edited twenty-seven books, including, most recently, People Get Ready: The Fight Against a Jobless Economy and a Citizenless Democracy (co-authored with John Nichols);Dollarocracy: How the Money-and Media Election Complex Is Destroying America (with John Nichols); and Digital Disconnect: How Capitalism Is Turning the Internet Away from Democracy. In 2000, McChesney authored the multiple award-winning Rich Media, Poor Democracy: Communication Politics in Dubious Times, which was reissued by The New Press in 2015 with a new preface by the author. His work has been translated into 34 languages. "I love this movie! This fast-paced documentary offers a crash course in the hidden history of the Internet – and how this revolutionary platform capable of enhancing freedom and democracy is being transformed into a vehicle for monopoly, hypercommercialism, and surveillance. As Prof. McChesney explains with total clarity, this is not a natural process but an evolution brought about by policy decisions made in Washington that were corrupted by corporate power. This documentary tells the bad news: the Internet, although birthed by the public’s tax money, was handed over, without public debate, to private corporations. And the good news: grassroots activists are now forcing a debate over the Internet and whether the public or a cartel should control it." “There is no educational goal more imperative than helping students understand the power and reach of the digital revolution, and there is no one better able to guide us through these lessons than Robert McChesney. In his numerous books McChesney has shown how revolutions in communication technologies change everything, from entertainment and politics to commerce and social life, and fundamentally shape our encounters with the world. Equally important, McChesney shows that these technologies do not exist in a vacuum, but are shaped by the political and economic forces of industrial capitalism, and despite their real emancipatory potential have mostly served to further entrench established interests. Digital Disconnect combines McChesney’s terrific explanatory skills with MEF’s wonderful production values and creativity, providing a one-stop 'zero-to-60' education in the most important topic of our times." "The release of this film based on Robert McChesney’s Digital Disconnect, updated to the present moment, is a most welcome development. The book itself is the most careful and penetrating analysis of how the promise of the internet has been distorted by concentrations of private power, undermining democracy and corrupting the general society. The film could hardly be more timely with new revelations daily illustrating the dangers of which McChesney presciently warned. It is a major contribution to the enlightenment and self-defense of citizens concerned with the state of their society and how we should act to overcome threatening social and institutional pathologies." "Digital Disconnect is a brilliant exposé documenting the harsh realities and economic fallout detrimentally impacting the everyday lives of Americans, and resulting in America’s rapid decline as a bastion of participatory Democracy. Intellectual luminary Robert McChesney takes a deep dive into the fundamental question of telecommunications policy: whose interests do digital technologies and media platforms serve? McChesney explores the contours of telecommunications history, and exposes the epic battle being waged by corporate behemoths to undermine the very foundations of our civil society. The evidence presented couldn’t be more stark." "This is the film on digital media’s impact on democracy that we have been waiting for. Robert McChesney is the leading scholar of the political economy of media, and he casts a critical eye on the congratulatory and self-serving myths promoted by corporate capitalism from the birth of the internet to Cambridge Analytica." 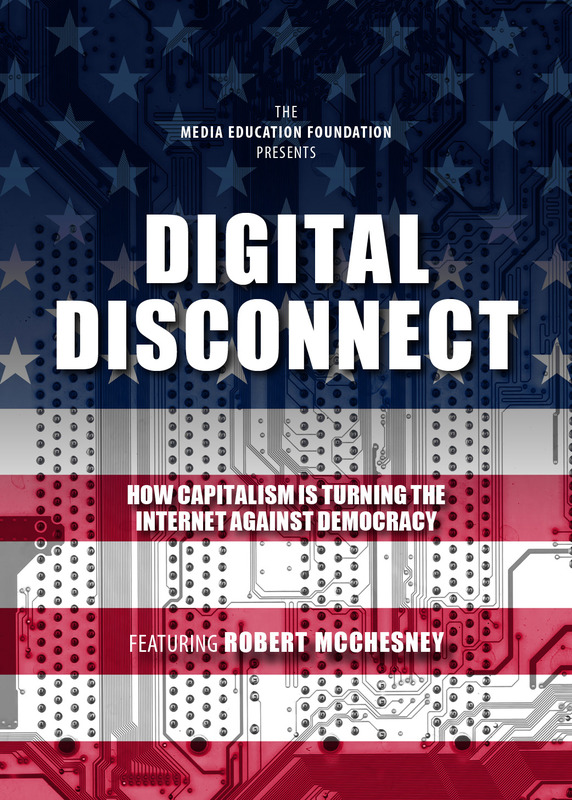 "In this masterful documentary, renowned media scholar Robert McChesney lays bare how unfettered capitalism and digital monopolies diminish the internet’s democratic potential. With systematic clarity, he provides viewers with the analytical tools to look beyond the hype and work toward real structural reform in our digital media system. Digital Disconnect is an essential and engaging resource for either in or outside the classroom. It will appeal to activists, policymakers, journalists, educators, and anyone concerned about the future of democracy. I loved this film and will definitely use it in my own classes!" "Digital Disconnect is a political ‘who dun it?’ that evokes the genres of both science fiction and historical period drama – with two very important differences. The story it tells is all too real, and while it has roots in the past it is occurring in our current moment, with significant implications for our future, and the future of democracy. Based on his important book of the same name, McChesney has woven together a political, economic, and technological narrative that is simultaneously educational, chilling, engaging, and, in the end, optimistic." "Digital Disconnect is the film every citizen should watch to understand what happened to American democracy. The writing is superb, and the narrative is presented with rich visualizations and historical examples that are perfect for introducing students to the connections between politics, economics and how we communicate about them. McChesney explains in simple terms how economic corruption has jeopardized representative democracy, and created a media system that threatens independent journalism. The daily diet of spin and disinformation is spread through social media, adding isolation, polarization, and 24/7 surveillance to the price of communication. The film concludes with an inspiring look at the vision of the Founders and points to solutions consistent with once hallowed American principles."